It has been twenty years since BMW last raced in DTM. That is a long time to sit out of one of the world ‘ most watched racing series. In terms of performance and how the aero keeps you pinned to the track, most drivers we ‘ve talked to say it one step below Formula 1. That is a pretty bold statement but these driver ‘s stand by it and insist that Suzie Wolff (driver of the Pink Mercedes DTM car) being a development driver for Williams F1 helps prove that point. Top speeds can approach over 180mph on some tracks, the aero allows high speed turns and the huge carbon fiber binders allow deep braking and scrub speed quick. With 22 cars on the grid it makes for an exciting situation- especially since there are no driver changes and two pitstops are mandatory. Having covered many ALMS races here at BimmerFile we are excited to take part in BMW ‘s return to DTM- following the teams around Europe as best we can to take in the events and races. This past weekend in Wiesbaden there were over 200,000 fans during the open celebration- and that is not even a race day! Coverage on the TV stateside is limited but we will do our best to bring you clips and video. Stay tuned for more BMW DTM action this weekend from Hockenheim! Official Release: The waiting is over: this weekend, BMW Motorsport will line up at the iconic Hockenheimring (DE) for the first race of its comeback season in the DTM. After an absence of almost 20 years, BMW is returning to the series to face a new challenge with three teams and six BMW M3 DTM cars. The race on Sunday marks the return of the BMW M3 to the DTM. The racing version of the sports car made its debut 25 years ago, and promptly won the DTM title at the first attempt. Now, as BMW M celebrates its 40th anniversary, the car is back again to perform in front of its many fans in the DTM. The brand was involved in the series on a works level between 1984 and 1992, during which time it really made a mark, notching up 49 wins, 30 pole positions and three drivers ‘ titles. The very first DTM race ever was won by a BMW driver: Harold Grohs (DE), at the wheel of the BMW 635 CSi. By the end of the season, Volker Strycek (DE) had secured the title in the same car. When the BMW M3 arrived on the scene in 1987, it immediately dominated proceedings and helped Eric van de Poele (BE) to victory in the drivers’ standings in 1987 – a feat that was repeated two years later by Roberto Ravaglia (IT). The first era of BMW in the DTM drew to a close in Hockenheim on 11th October 1992, and the company now returns to the same circuit to open a new chapter in its successful motorsport history. Reigning DTM champion Martin Tomczyk (DE) will contest the season alongside Joey Hand (US) with BMW Team RMG. Just as it was back then, BMW Team Schnitzer is once again involved under the leadership of Team Principal Charly Lamm. Bruno Spengler (CA) and Dirk Werner (DE) will line up for the team from Freilassing. Three-time World Touring Car Champion, Andy Priaulx (GB), and Augusto Farfus (BR) will represent BMW Team RBM. The six drivers have a strong ally in the BMW M3 DTM. It has been developed from scratch by BMW Motorsport and will follow in the footsteps of the legendary first generation of M3 when it takes to the track in 2012. Following the roll-out in July 2011, the BMW M3 DTM completed thousands of test kilometres before it was homologated by the Deutscher Motor Sport Bund (DMSB) on 1st March this year. BMW has scored more DTM victories at the Hockenheimring than any other circuit, with BMW drivers crossing the finish line first on ten occasions. Many of the stars from back then will also be there at the track to watch the return of BMW to the DTM live: Grohs, van de Poele and Ravaglia will be joined in Hockenheim by Steve Soper (GB). BMW is celebrating a hat-trick of anniversaries in 2012: BMW M was founded 40 years ago, and has tasted countless successes on the racetrack over the following decades. Twenty five years ago the BMW M3 started to write its unique success story in motorsport. Even today, the racing version remains the most successful touring car of all time. And finally, it is now 20 years since BMW last appeared in the DTM with a works team. Eleven BMW racing cars lined up at the first DTM race in Zolder in 1984. Volker Strycek did not win a single race in 1984 – but was still crowned champion. The first generation of BMW M3 achieved a top speed of 280 km/h on the straights through the Hockenheim woodland. BMW Team Schnitzer crossed the finish line in first place on 17 occasions between 1989 and 1992. Charly Lamm was on the pit wall for BMW Team Schnitzer when Roberto Ravaglia triumphed back in 1989. Harald Grohs won the first ever DTM race in Zolder at the wheel of the BMW 635 CSi. In a dramatic finale, 25-year-old Eric van de Poele finished tenth in the final race of the season to win the 1987 title in a BMW M3. Roberto Ravaglia gave the BMW M3 a triumphant farewell from the DTM with two victories in Hockenheim on 11th October 1992. Nowadays, Ravaglia runs his own ROAL Motorsport team and takes his place in the pit lane as Team Principal. Among other things, he now lines up with BMW racing cars in the World Touring Car Championship and the Italian GT Championship. BMW drivers finished first and second at 15 races in the DTM between 1984 and 1992. As well as the BMW 635 CSi and BMW M3, the BMW 323i also has three DTM wins to its name – with Winfried Vogt at the wheel on all three occasions. Andy Priaulx comes from the Channel Island of Guernsey, which is part of Great Britain. Priaulx won a hat-trick of titles in the World Touring Car Championship driving for BMW Team RBM in 2005, 2006 and 2007. Augusto Farfus is from Curitiba, the capital of the Brazilian state of Paraná. The Farfus family runs a large chain of restaurants in Curitiba and other Brazilian cities. Bruno Spengler won his first DTM race at the Norisring in 2006. It remains his favourite circuit to this day. Spengler is an avid golfer with an excellent handicap of 5.8. Martin Tomczyk finished tenth in the penultimate race of the season to secure the DTM title in 2011. Only Timo Scheider and Mattias Ekström have contested more DTM races than Tomczyk. Tomczyk is 1.88 metres tall. This makes him the tallest of the BMW drivers. In 2007 and 2009 Dirk Werner was unbeatable in the GT class of the GRAND-AM series, and won the title on both occasions. At the same time as his racing activities, Werner has also successfully completed his Mechanical Engineering studies. Joey Hand is the reigning GT champion in the American Le Mans Series and will race there again for BMW Team RLL in 2012. Hand loves to go fishing with his father and family. Marco Wittmann provides support for the six BMW DTM drivers over the course of the season as test and development driver. When developing the BMW M3 DTM, BMW motorsport engineers created over 2,500 CAD graphics, with over 900 for the engine alone. More than 1.2 kilometres of cable run through the BMW M3 DTM. Approx. 5,400 individual parts are used in the BMW M3 DTM. 1,200 of these are different. It takes about 60 hours to assemble the BMW P66 engine. Over the course of a DTM race, no less than 1.8 million ignitions take place in the BMW P66 engine. The carbon-fibre brake discs reach temperatures of up to 700°C. The strain put on the brakes is particularly high at circuits like the Norisring. Fingers crossed for BMW M3 Teams. THANKS!!!! I was wondering how I was going to watch the start of the season here in the US, as no TV networks are scheduled to show it. these cars are so highly modified from the production models, DTM reminds me of NASCAR in that regard. Somehow I get much more of a thrill from LeMans prepped cars which seem much closer to the street counterparts. I can understand that to some degree but GT cars are far from production cars. LMP classes share zero. Truth is there is no transfer of technology from GT racing to production cars, it actually works the other way around. It is also painfully expensive and subjective to the ruling authority, I’ve heard the politics stories an seen the results personally. DTM is more like Grand AM, on steroids. I love GT racing and have covered it enough to know that unless you drop a lot of money to either get a rule changed or build homologation specials there is no way to race if your products don’t fit a the rules. BMW will not have a naturally powered M car going forward so they are SOL in ALMS and I think they are fed up, the “green” racing series is anti turbo and direct injection. DTM has been designed this go around for KERS/Hybrid so that is coming in the next year or so. They are looking at being F1 with bodies, Japan, Australia, Europe and the US under one set of rules. It promises to be something entertaining at least with additional brands in each market. We shall see but the plan is a good one. There are some sticking points as with any negotiations, but even after that “collapse” I heard negotiations were still on-going. There are also “phases” of this next gen DTM rollout, the current drivetrains have a 1-2 year life before the new lower displacement with hybrid/KERS comes in which is not all that different. I wouldn’t read too much into what the media says…. Most don’t know how this is all going to play out at the end of the life cycle. 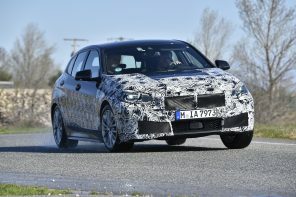 Also- BMW is due for a new chassis refresh when the E92 replacement comes. Same time the S5 is due for a refresh. I also just wanted to state that while we have some knowledge of the on-going negotiations we do not know everything and just like in everything else things can change at an instant.